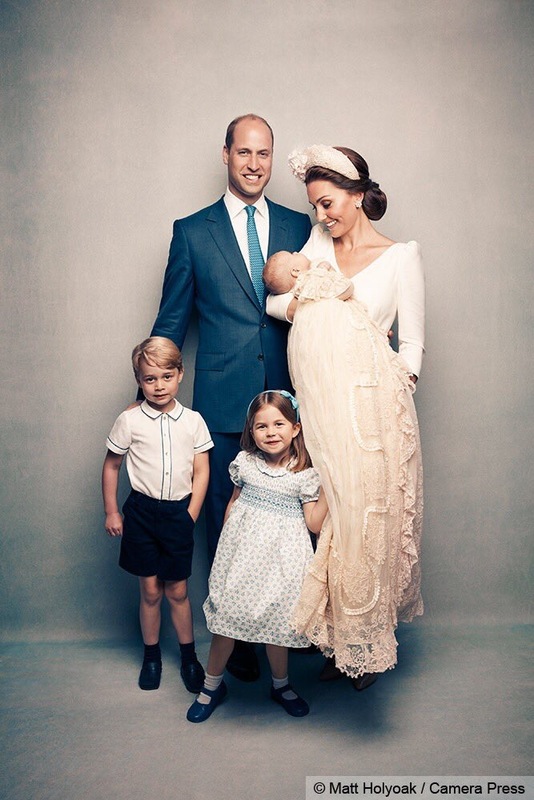 Kensington Palace and The Duke and Duchess of Cambridge released official photos this evening from the christening of Prince Louis which took place last Monday. 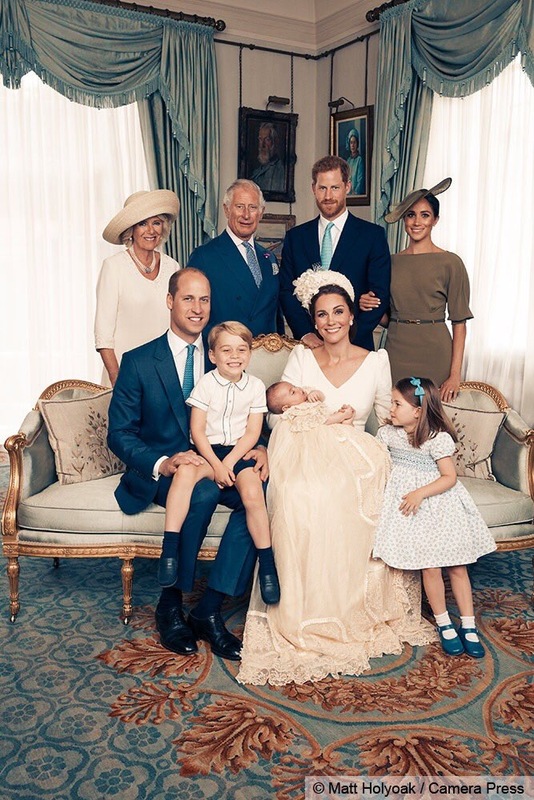 The picture above is an image featuring only members of the Royal Family (from l to r): the Duke and Duchess of Sussex, the Prince of Wales and Duchess of Cornwall, the Duke and Duchess of Cambridge, a beaming Prince George, Princess Charlotte and Prince Louis who looks content sleeping in mum’s arms. The images were taken in the Morning Room at Clarence House by photographer Matt Holyoak. 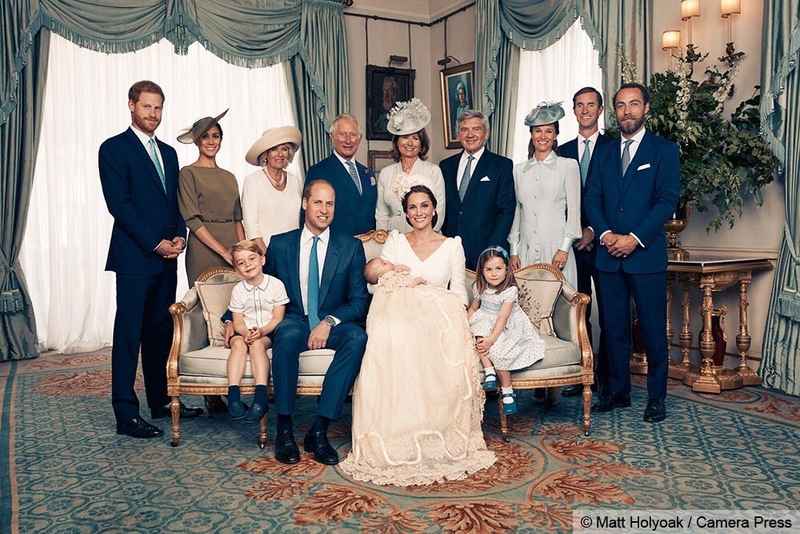 Another image taken in the Morning Room: a portrait that includes both the Royal Family and Kate’s family; Michael and Carole Middleton, her sister Pippa Matthews with her husband James and brother, James Middleton. These are the first official family portraits taken since Harry and Meghan’s wedding. A solid backdrop was used for ‘The Cambridge Family’ portrait. In this one, Prince Louis and mum are having a bonding moment while Princess Charlotte has a bit of that “cheeky look” shining through. The last photo was taken in the garden at Clarence House. The little prince looks so relaxed, a tender, sweet moment with mummy. UPDATE: A fifth photo was released Monday morning, 16th July of Kate and a very awake and happy Prince Louis in the Garden at Clarence House. 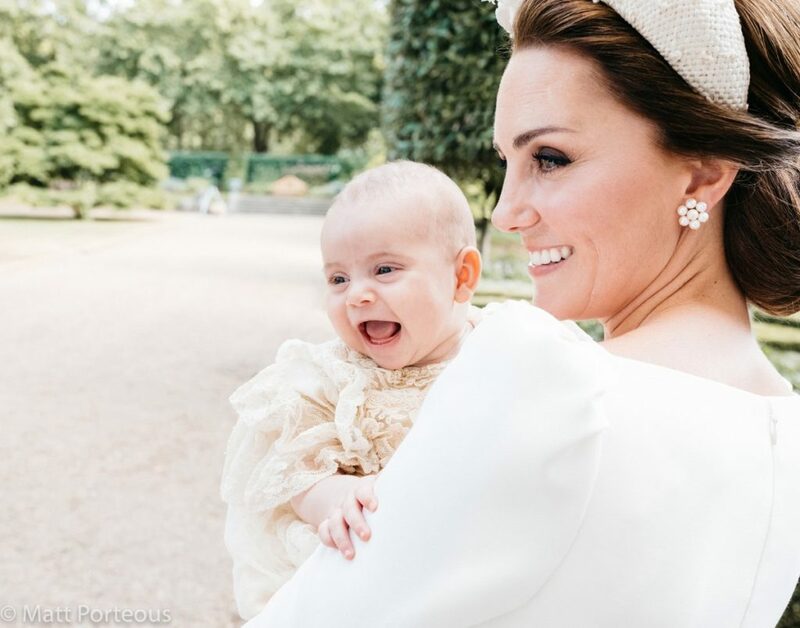 I was truly honoured at being asked to take the official photographs at the christening of Prince Louis, and to witness at first hand such a happy event. Everyone was so relaxed and in such good spirits, it was an absolute pleasure. 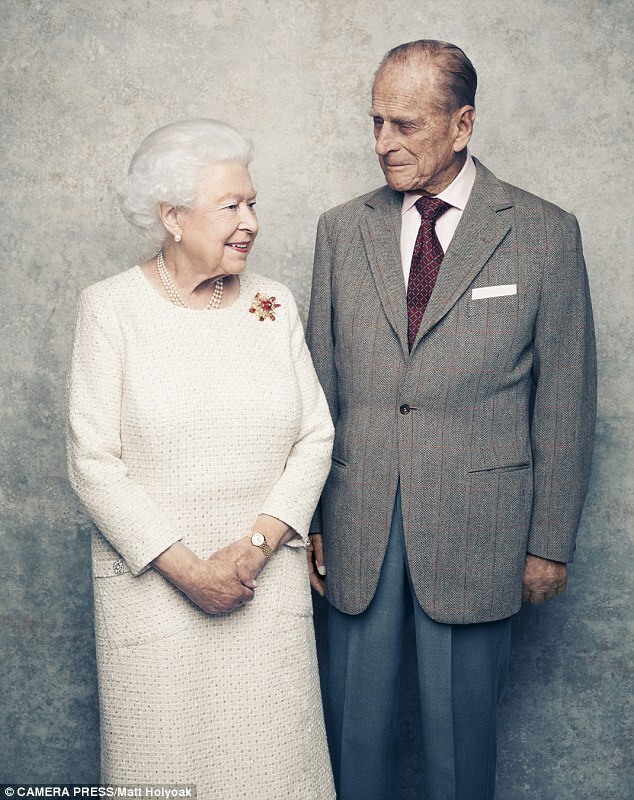 You may recall that Mr. Holyoak took the photos of the Queen and Prince Philip last year for their 70th wedding anniversary. Below, one of the anniversary photos. You can see more of Matt Holyoak’s photos, including the Queen and Prince Philip’s photos here. Our original post on what Meghan wore for the christening is here. very fashionable ensemble and the color looks great on her. Meghan must have looked at the room in picking the color of her outfit … folks were questioning it when photographed at the church but it looks so right in this room! Clearly she’s picking up hues in the furnishings and is providing a nice counter-balance to all the blue and cream. Meghan has incredible posture which displays her energy, style and core strength. Her head is held high,straight, and upright which allows her hat, which sits at an angle, to be complimentary. I’m impressed! I tried to incorporate the “Duchess Slant” yesterday in church and couldn’t last for 5 minutes before squirming. I’m curious about all the Royal men, and Middletons, in blue suits. Is this the appropriate semi-dress attire for men in their position or, is it personal choice, fad, or request made by the Queen/Kate? They also use hat pins, especially when they have a bun. Long pins, around 3 inches, sometimes with a decorative end, sometimes not, that pierce through the hat and through the hair, and then back into the hat. They work really well. Loved Meghan’s ensemble on the day, and now it seems the perfect choice to stand out from the cream draperies. Lovely photos.